Thank you to each and every Co-op Member. Because every member who bought selected Co-op branded products or purchased a Pre-Paid Funeral Plan, or a Will or selected electrical products or any other eligible product or service from us since November 2017, has helped make a £19 million difference to local communities across the nation. It’s such a simple way to support your local community. Just for buying select Co-op branded products and services Co-op Members earn 5% back for them and 1% back for their choice of local cause*. Today we’ve announced the Local Community Fund is paying out an amazing £19 million to over 4,000 local causes. This is just one way our co-op difference supports local communities. I’ve worked for Co-op since the beginning of this year and I’m so proud of what our Members and colleagues have achieved for their local communities. This support is vital for local causes too, as 1 in 4 local causes fear for their survival, according to our recent Causes and Effect report. Don’t forget, on 24 November in a Co-op store near you, we’ll be celebrating with some of your local causes and thanking Co-op Members for making a difference to their local community. Find out what celebrations are happening in your local community by popping in-store. And there’s another reason to celebrate! The Edge, a local cause which benefited from over £4,000 from the Local Community Fund in November 2017 has recently won an incredible accolade for the project which Co-op Members have helped support. 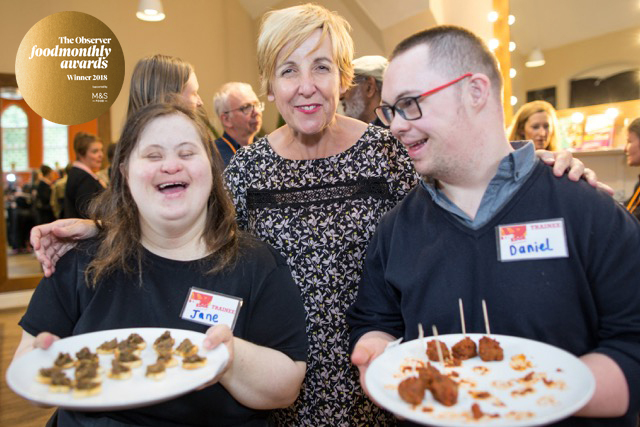 The Observer named the theatre’s cafe, The Dressing Room, a local food hero for their work supporting adults with learning difficulties. A huge congratulations and proof that the difference Co-op Members make in their local communities can stretch beyond the initial funding local causes receive from today. *Members earn 1% for local causes when they buy selected Co-op branded products and services from selected Co-op Group businesses. The £19 million raised and given to local causes has been generated since November 2017 from the 1% Members earn for local causes, proceeds from the carrier bag levy and Co-op Scratch Cards and profits from the sales of our reusable bags. Purchases made in independent societies including Midcounties, Central England, Southern or Chelmsford Star co-operatives or in non-Co-op branded stores (such as NISA or Costcutter) are excluded. Membership T&Cs.